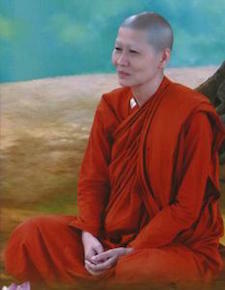 Samaneri Dhammadipa is the abbess of Thippaya Sathan Dhamma Bhikkhuni Arama in Songkhla, Thailand. She holds a B.A. in Political Science from Ramkamhaeng University, and made further studies in Radio Broadcasting. As is the plight of many Thai women, she earned her money singing in a hotel and servicing male customers’ desires. During this time to ease her pain she became addicted to drugs. She came to clarity when she saw the monotony of such a life, and at the age of 35 she ordained as an 8 precept, white-robed nun. She remained ordained ever since and has been a Theravada Samaneri for 2 years now. Her journey included trying to build meditation centers in Pattaloung, and then in Chiang Mai which both failed. During this period she got cancer and struggled to overcome it. Now, she is successful in her establishment of a meditation center in Songkhla. Her temple focuses on providing meditative techniques for revitalizing the mind and body of cancer patients and the elderly. She creatively employs: yoga, chi kong, and music-movement therapy. She also provides various activities to help moral and ethical development of teenagers, government officers and the private sector.